Villain: Chapters, Indigo, Coles, Smithbooks, etc. Chapters/Indigo/Coles/Smithbooks/World’s Biggest Monolith of Public Book Fear. Getting the company names straight is a task in itself and can be directly correlated to a shopping experience at any Chapters/Indigo location—often confusing, and full of overwhelming feelings of despair. The simple task of trying to find a book is complicated and made more difficult by tables, displays, and towers of “lifestyle” items that must be overcome before proceeding to an actual book section. Even then, though, the quest can become more tedious based off of the perpetually perplexing, arbitrary categorization system. Why is there a “Literature” section? It’s all literature isn’t it? 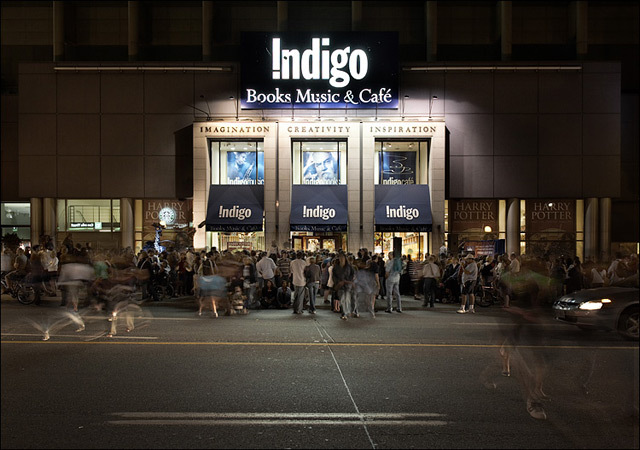 With a lack of quality, intellectual book service and a lack of support for the Toronto literary community, let alone Canadian literature, Chapters/Indigo is physically and intellectually what a book store is not. Independent book stores with rickety hardwood flooring; the pungent fragrance of old, dust-infested books; store owners who know their books; and those wonderfully rare gems hidden between dust and questionable food stains are a dying breed. We can’t let them be consumed. The assimilation process of Chapters/Indigo is monstrous––support your local book store before they take over. Chapters/Indigo may look pretty and have seemingly nice “feel-good items” for the household, but if they’re supposed to be a book store, it should be about the books. Photo by wvs from the Torontoist Flickr Pool.